$75.00 In stock. Order in the next 3 hours, 3 minutes and it will go out today! The magician has the spectator examine two tubes and eight colorful, big dice (there are two of every color). 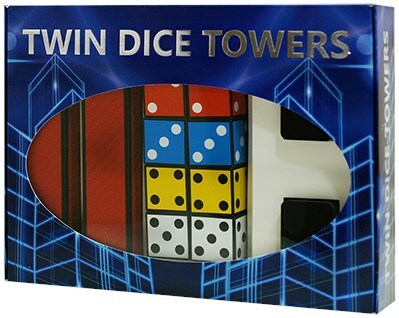 The spectator puts the dice into a gift bag, and after shuffling them, they draw one die at a time from the bag - alternating with the magician - and place them into each tube. While doing this, nobody tells or shows what colored die they picked, they just put the die into their own tube. When the magician lifts the tubes it can be seen that miraculously the dice in both tubes are in the same order, the colors are following each other in the same way! The trick can be performed while sitting at a table, in a group or even on stage!